International Partnerships in Ice Core Sciences (IPICS) consists of ice core scientists, engineers, and drillers from the leading laboratories and national operators carrying out ice core science. This volume consists of work based on some of the papers presented at its second open science meeting held in Hobart (Tasmania, Australia) in March 2016. They cover a range of topics related to all aspects of ice core science, including recent drilling projects. Papers that help to define site characteristics, as well as those that link ice core work to other aspects of palaeoclimate, are included. A 120 m ice core from Mill Island, East Antarctica, was studied its chemical components. The Mill Island ice core contains 97 years of climate record (1913–2009) and has a mean snow accumulation of 1.35 m yr−1 (ice equivalent). 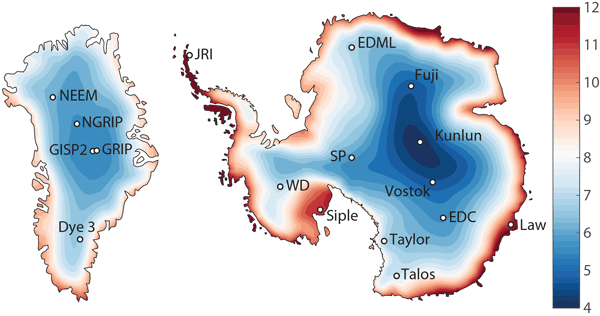 Trace ion concentrations were generally higher than other Antarctic ice core sites. Nearby sea ice concentration was found to influence the annual mean sea salt record. The Mill Island ice core records are unexpectedly complex, with strong modulation of the trace chemistry. Using records of a long-lived radioactive nuclide (10Be) that is formed globally in the atmosphere and deposited within a few years to the earth’s surface, we have synchronized three Antarctic ice cores to one from Greenland. This permits the climate and other environmental parameters registered in these ice cores to be put on a common timescale with a precision of a few decades, thus allowing different models and mechanisms associated with these parameters to be tested with the same precision. Uncertainty of sea level changes is a challenge. As Antarctica is the biggest water reservoir, it is necessary to know how it will contribute. To be able to simulate it, an understanding of past climate is to be achieved, for instance, by studying the ice cores. As climate change is different in different regions, observations are needed all over the continent. Studying an ice core in Adélie Land, we can conclude that there are no changes there at decadal scale over the period 1947–2007. Understanding the Antarctic climate system is crucial in the context of the present-day global environmental changes, but key gaps arise from limited observations. We present a new reconstructed stacked climate record for Princess Elizabeth Land, East Antarctica. Records show 1 °C warming over the last 350 years, with a particularly cold period from the mid-18th to mid-19th century. Temperature variability with a period > 27 years is mainly related to the anomalies of the Indian Ocean Dipole mode. Here, we review previous attempts made to reconstruct past forest fire using chemical signals recorded in Greenland ice. We showed that the Greenland ice records of ammonium, found to be a good fire proxy, consistently indicate changing fire activity in Canada in response to past climatic conditions that occurred since the last 15 000 years, including the Little Ice Age and the last large climatic transition. Here, we focus on the Concordia Station, central East Antarctic plateau, providing a multi-year record (2008–2010) of daily precipitation types identified from crystal morphologies, precipitation amounts and isotopic composition. Relationships between local meteorological data and precipitation oxygen isotope composition are investigated. Our dataset is available for in-depth model evaluation at the synoptic scale. We explore the effects of melting of the East Antarctic Ice Sheet on the Southern Ocean. Using a climate model, we find that melting changes the ocean circulation and causes warming of more than 1 °C at depth. We also discover the potential existence of a "domino effect", whereby the initial warming spreads westwards around the Antarctic continent. Melting of just one sector could therefore destabilise the wider Antarctic Ice Sheet, leading to substantial increases in global sea level. The upper 50–100 m of the world's ice sheets consists of the firn layer, a porous layer of snow that is slowly compacted by overlying snow. Understanding air movement inside the firn is critical for ice core climate reconstructions. Buizert and Severinghaus identify and describe a new mechanism of firn air movement. High- and low-pressure systems force air movement in the firn that drives strong mixing, called dispersion. Dispersion is the main mechanism for air mixing in the deep firn. This study details a systematic approach to finding a new high-resolution East Antarctic ice core site. The study initially outlines seven criteria that a new site must fulfil, encompassing specific accumulation, ice dynamics and atmospheric circulation aspects. We then use numerous techniques including Antarctic surface mass balance syntheses, ground-truthing of satellite data by airborne radar surveys and reanalysis products to pinpoint promising regions.